A Note for all you Weigh In Challengers: Don't forget tomorrow is Weigh In Wednesday. Weigh yourself first thing in the morning and email me your progress at WeighIn@captivate.com. If you haven't joined the challenge yet, it's not too late! Weigh yourself, take a "before" picture, get your measurements and send everything to WeighIn@captivate.com. The challenge ends June 21st – the first day of summer – so we've got 7 weeks to go! Have you ever heard of coconut water? I'll be honest, I hadn't until recently. Some friends turned me on to it a few weeks ago. Then ... it started to pop up everywhere. So, what is it? Coconut water, the clear liquid that comes from the coconut, has been popular in Brazil for years. It's a mix between water and a sports drink, and is loaded with electrolytes. It also has 15 times more potassium than a banana – that's a lot. One 11.2 oz box has 60 calories and no fat. Plus, it's really yummy. As a disclaimer – if you plan to replace water with coconut water post workout it isn't really necessary unless you are training for over an hour. But, it you are choosing between coconut water and a sports drink (i.e. Gatorade or Powerade) choose coconut water. Every time. 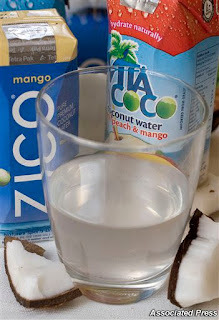 There are three major brands of coconut water available in the US: ZICO (Coke is a major investor), O.N.E. (Pepsi is the U.S. distributor), and Vita Coco. Each brand has various flavors...some that are better than others. It can be a little pricey – one 12-pack is around $21. Just remember it isn't something that should replace good old water. Just try it. You will definitely enjoy it! This entry was posted by kate, on Tuesday, March 30, 2010. You can leave your response . LOVE coconut water. It is my default after Bikram's, and absolutely helps rebalance my electrolytes. This is a good alternative to sports drinks but be careful of the sugar. There is alot more sugar than I originally thought in coconut water. Although it's natural, it still adds to the waistline!